The new Website Audit tool in SEOprofiler offers many powerful features that will help you to get better rankings for your web pages on Google and other search engines. You can open the dashboard page by clicking on the SEOprofiler logo in your SEOprofiler account, or by selecting Your account > Your projects in the menu on the left in your account. When you create a new project, the Website Audit tool will automatically create an audit report for the site. Depending on the size of the website, this can take some time. 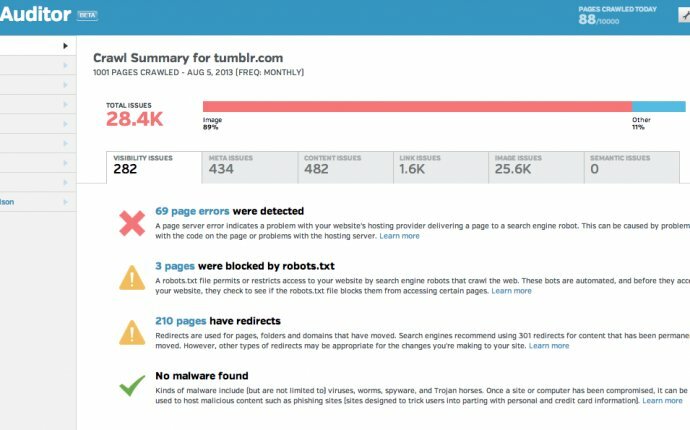 The overview page shows the errors that the Website Audit tool found on your pages. Click the ‘Show pages’ button next to an error to view the pages of your website that contain this error. After clicking the ‘Show pages’ button, you will see the pages that contain a particular error. Alternatively, you can click ‘Checked files’ in the menu on the left to get an overview of all checked files. The errors are grouped into different categories: real errors (things that have a negative influence on your rankings), warnings (things that might have a negative influence on your rankings), notices (things that do not affect your rankings but are bad for the user experience), and spelling mistakes. Each error has a ‘To do’ that shows the things that you have to do to remove the error. If you correct the errors that the Website Audit tool found on your pages, it will be easier for search engines to index your pages. In addition, you make sure that your website visitors don’t encounter errors.